We are proud to offer to the general public a water cooler with true commercial-grade construction and a classic, contemporary design. The Clover B7A Commercial Grade series provides you with the same heavy-duty framework and internal hardware of the high-end coolers traditionally leased and sold through by professional water delivery companies, but at a significant cost savings. While they are durable enough to withstand years of abuse and heavy traffic, they also have a sleek, modern design that fits perfectly into any home or office dï¿½cor, and a whisper-quiet running sound that will ensure they go unnoticed except when they are in use. Start enjoying chilled water for drinking or baking. Experience the convenience of hot water for instant beverages, cereal, soups and tea, all at your fingertips with the Clover B7A. 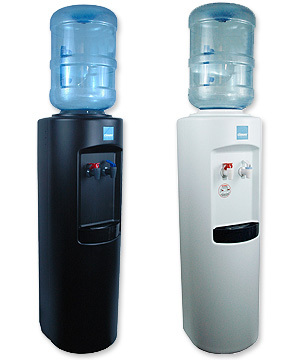 This quality water cooler includes a full internal steel frame and a UV protected, high density polyethylene outer shell that is not only durable but easy to clean. The B7A features a hygienic stainless steel water tank. It comes with a no spill top for easy pour 5 gal bottles, and a patented leak guard to keep your floor safe in the case of a leaky bottle. The one piece ABS drip tray is removable for easy cleaning and the entire unit is a breeze to move with a built in heavy duty metal handle on the back. The Clover B7A water dispenser comes with a cold water thermostat so you can control the water temperature to your preference. Hot water is fixed at 185ï¿½ F by an automatic thermostat, and has a child proof faucet. Excellent product! This product met all my expectations and I have no hesitation to recommend it to anyone. The flow of the water is its biggest plus. I don't get impatient filling up my glass. The cold and hot temperature of the water is just perfect. I also like the child-proof feature of the hot water dispenser. The looks are also great. And super quiet. - Charley Hilton. San Diego, CA. Could not be happier! We love our new water dispenser it is AWESOME. The water gets very very cold which my husband loves and I like the room temp water. When we want hot water it too gets very hot and gets hot fast at that. So yes we would recommend this to everyone. Excellent product! The Clover Hot and Cold water dispenser was the best value I found on line or in the stores. It was shipped quickly and set up was easy. Very happy with this product so far. - Melville. Virginia Beach, VA.
Water is super hot and super cold! I am so happy with this water cooler. It's head-and-shoulders above any other in-home model I've used or owned. The water dispenses quickly and is ice cold and coffee hot and I love my coffee HOT! I play tennis outdoors and am always filling water bottles from the cooler. It used to take me 5 minutes or so to fill 6 bottles. Now it only takes me a minute or two. The cooler arrived very quickly and was easy to put together and put into use. I also like that I can use a 5 gallon or 3 gallon bottles with no problem. I can't be happier.